NOTE: This page MAY also take up to a minute to fully load so please have a little patience! Hi There, my name is Kim Andras Bourg. I have a life-altering PHYSICALLY progressive neurological disease/disorder called Friedreich’s Ataxia (FA for short). This is one of the forms of a Hereditary Ataxia. This disease/disorder attacks the nerve cells throughout the entire body which causes the muscles in the body to weaken; as more and more nerve cells die, simple everyday tasks become more and more difficult to perform which eventually leads to a life of total dependence. The only thing part of the body that is NOT affected by this disease/disorder is the brain, therefore & I cannot stress this enough, Friedreich's Ataxia DOES NOT AFFECT MENTAL ACTIVITY !,.. leaving an active and often very intelligent mind trapped in a severely physically disabled body. Since the age of 40, I using a powered wheelchair. I have slurred "drunken" speech and lack of coordination, which are both gradually getting worse. I also have a HEARING IMPAIRMENT (nerve deafness)which affects both ears and which is gradually getting worse ... so I have to see/read your lips when you are speaking to me so please face me when talking to me, speak a little louder, talk a little slower than you normally do, and try to speak as clearly as possible! 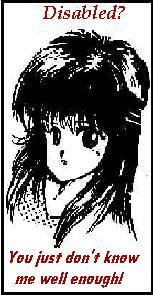 …So please try to remember that even though I am wearing my hearing aides and can hear somewhat better with them on, that I still need to read lips/see facial expressions more often than not to "make-out" what is being said! So again please remember to face me when talking to me, talk a little slower than you normally do, speak a little louder, use hand gestures and try to speak as clearly as possible! 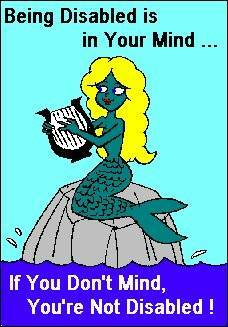 Try to reduce or eliminate background noise. Talking face-to-face helps. Listeners watching a speaker’s face gain extra help from watching the mouth and, if they are closer, will also be able to hear better. Make sure there is adequate lighting and try to reduce glare as much as possible. Allow plenty of time; talking with someone who has a speech problem always takes longer, and they’ll manage better if they feel relaxed, not rushed. Be an active listener, giving the person with ataxia your full attention. This may well involve concentrating more and listening harder than usual. Be honest. If you don’t understand, don’t pretend to. Acknowledge what you do understand, so that the speaker doesn’t have to repeat the whole message unnecessarily, then let the speaker try to fill in the gaps by repeating the missing information. I have NO balance control of my body anymore, which means that I cannot sit upright without holding on, grabbing/pulling on or leaning onto something. I choke very easily due to swallowing problems.... My upper body "flys" forward when I sneeze or cough & my arms go every which way! My feet & legs are extremely sensitive to touch and coldness, which can be painful sometimes, so I usually wear socks all the time which seems to help somewhat with the sensitivity. I personally think that the worse part of this disease is having my hearing & speech affected. Most people automatically assume that those of us who have Ataxia are mentally handicapped and often treat & speak to us this way because of the way our speech sounds and also because our of awkward body movements; As I stated before, Friedreich's Ataxia DOES NOT AFFECT MENTAL CAPACITY which leaves an active and intelligent mind trapped in a body that continues to slowly fall apart physically daily! In the past few months my FA has gotten extremely worse but I try to stay positive ,,… I guess ya can say that I am kinda like the energizer bunny…I keeps going & going & going…! HAHA, get it?! I simply have a challenge a little different from you. Each obstacle is a victory, enabling me to grow. I don't want to be treated as if I'm not a person anymore. But sometimes I have to fall, and sometimes I need to cry. For He doesn't see me as disabled, He just sees me as me. A person with any form of Ataxia, or any disability for that matter, should not lose hope! Any disability you now have or may develop in the future, only you can determine whether or not you will let them handicap you. True, you may be limited in a number of ways, but there are many things you can do despite these limitations. Work with your uniqueness, your abilities and talents, use them to the fullest. Be determined and reach for your highest goals in life: spiritually, emotionally, and physically. Appreciate what you do have. Enjoy people and things to the fullest. Live one day at a time. It's all any of us really have. Do what you can to make the most of your situation, and then relax, and let it be. not what we can't do with what we don't have" - C.H. Brewer. "There are two ways of meeting difficulties: you alter the difficulties, or you alter yourself to meet them"
The word, “ataxia”, comes from the Greek word, “a taxis” meaning “without order or incoordination”. The Medline plus Merriam-Webster Medical Dictionary defines ataxia (a-tak-se-a) as, “An inability to coordinate muscular movements that is symptomatic of some nervous disorders.” The word ataxia is often used to describe a symptom of incoordination which can be associated with infections, injuries, other diseases, or degenerative changes in the central nervous system. Although more than 150,000 men, women and children across the United States are affected by either a hereditary form or a sporadic form of ataxia, many people are unaware of the disease. 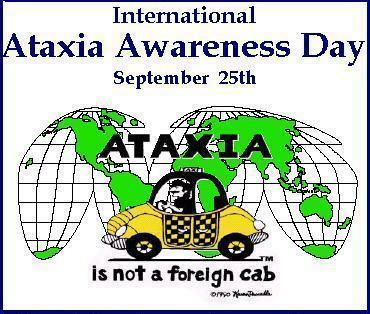 Any form of ataxia can strike anyone anywhere in the world and has no regards to age, race and/or gender! As with many degenerative diseases of the nervous system, there is currently no cure for Ataxia. "replied" emails back to their original state so they're easier to read. so download it now! --> CLICK HERE! PLEASE TAKE A MOMENT & SIGN/VIEW MY GUESTBOOK BELOW AND LET ME KNOW YOU STOPPED BY!! Did You Remember To Bookmark This Page?? ?